Catalonia is a country of textile tradition. We can see it at the 080 Barcelona Fashion catwalk with the participation of established brands like Naulover, which still produce their fashion here. Also in professional textile fairs like BSTIM –Best Solutions in Textile Manufacturing-, an international trade show held in Igualada that pretends to boost local textile design production and strengthen our textile industry while attracting fashion brands, designers and distributors in Europe. 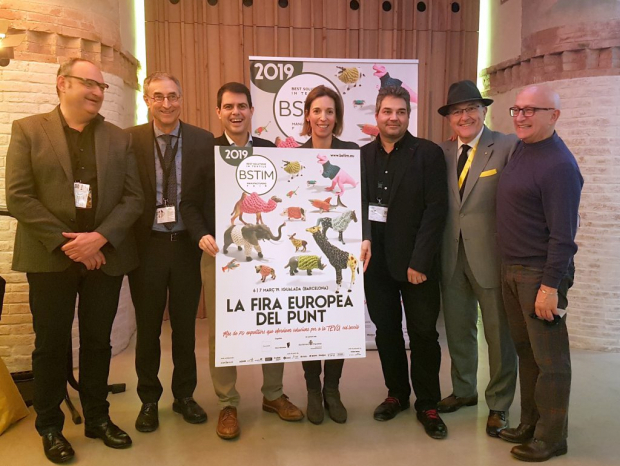 Organized by Fira d’Igualada and Fagepi, with the support of Igualada’s city council, BSTIM announced the dates of the upcoming edition within the last 080 Barcelona Fashion. Next BSTIM fair will take place on 6th and 7th of March 2019 in Igualada, as it is a biannual trade show. Organizers are now preparing this next appointment to keep growing and establish the fair as one of the benchmarks of local textile design and production in Europe. The last BSTIM fair celebrated in February 2017, gathered around 60 exhibitors and 1,400 visitors in Igualada. The foreign attendees came mainly from Russia, England, Sweden, Holland and Italy, among other countries, to discover the textile collections of the participants. The difference between BSTIM compared with other trade shows is that here the exhibitors not only show their current offer but also their design and production capacities to be able to attract production orders to Catalonia. After three editions, it seems that the challenge has been achieved as there are already some productions that before were assumed in other countries. On the 6 and 7 March 2019 BSTIM expects to close more deals in this direction.